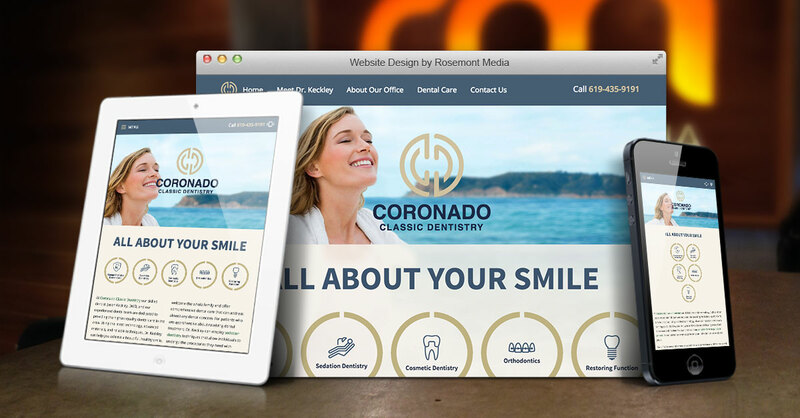 Dr. Jason Keckley teamed up with Rosemont Media to develop a clean, contemporary, and informative website for his new practice, Coronado Classic Dentistry. In his custom website package, the San Diego dentist chose to include some of our most advanced features and services, such as dental SEO, responsive design, custom content, and an educational news blog to establish his expertise and online presence, as well as help his new practice flourish. Borrowing from the surrounding Coronado landscape, our team created a relaxed coastal-themed design that incorporates ocean scenery and a seaside color scheme of navy blue and sand tones. The simple, intuitive navigation and dropdown menus allow visitors to easily find the information they are looking for and learn more about the many dental services that are provided. Coronado Classic Dentistry’s website is suited to the needs and lifestyles of the patients Dr. Keckley serves, which allows him to deliver a customized visitor experience that reflects his practice values and philosophy. To view an example of the advanced and visually stunning dental websites that Rosemont Media creates, please visit www.dentistcoronado.com.